The expression “yachting” is not only a statement about size, but it also describes a lifestyle aboard the intimate vessels. Nobody does this better that SeaDream with their 56 stateroom twin yachts favored for their elegant informality, personal award-winning service provided by a crew of 95. All accommodation onboard has a view of the ocean and the yacht has an open bar and where no gratuities are required. With only 112 guests at a time, a SeaDream voyage feels like your personal getaway. So how can you make a voyage with SeaDream better? Book one of their newly announced Grand Voyages in 2019 or 2020 and you can be assured that you will be spoilt from the moment you step onboard and begin your voyage to leisurely explore distinct destinations in one journey. “Our grand voyages resonate with travelers looking for a carefree vacation where they can unwind while exploring some of the World’s most iconic destinations,” said Andreas Brynestad, SeaDream Yacht Club EVP of sales, marketing, and operations. “Grand voyages will allow guests to enjoy an extended vacation and visit many ports whilst only having to unpack once. A selection of Grand Voyages which are offered in 2019. SeaDream Yacht Club is one of Sovereign’s favorite cruise lines and our Managing Director enjoys spending time on the yachts because of what they offer. 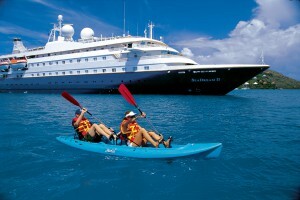 SeaDream is where can you be pampered, receive second to none service onboard and have everything included. To experience SeaDream for yourself call our Luxury Cruise Specialists on 03331 224466 or visit our website www.sovereigncruise.co.uk . We look forward to helping you with your luxury cruise plans.